For other uses, see Nori (disambiguation). Nori (海苔) is the Japanese name for edible seaweed (a "sea vegetable") species of the red algae genus Pyropia, including P. yezoensis and P. tenera. It has a strong and distinctive flavor. It is used chiefly in Japanese cuisine as an ingredient to wrap rolls of sushi or onigiri, in which case the term refers to the dried sheets. The finished dried sheets are made by a shredding and rack-drying process that resembles papermaking. They are sold in packs in grocery stores for culinary purposes. Since nori sheets easily absorb water from the air and degrade, a desiccant is needed when storing nori for any significant time. The Academy of Nutrition and Dietetics established in 2016 that nori is not an adequate source of vitamin B12. Nori also contains toxic metals (arsenic and cadmium) and amphipod allergens, so its daily consumption in large quantities is discouraged. 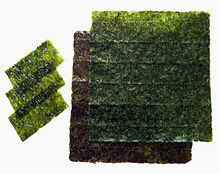 Originally, the term nori was generic and referred to seaweeds, including hijiki. One of the oldest descriptions of nori is dated to around the 8th century. In the Taihō Code enacted in 701, nori was already included in the form of taxation. Local people have been described as drying nori in Hitachi Province Fudoki (721–721), and nori was harvested in Izumo Province Fudoki (713–733), showing that nori was used as food from ancient times. In Utsubo Monogatari, written around 987, nori was recognized as a common food. 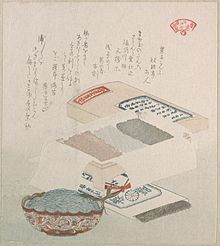 Nori had been consumed as paste form until the sheet form was invented in Asakusa, Edo (contemporary Tokyo), around 1750 in the Edo period through the method of Japanese paper-making. The word "nori" first appeared in an English-language publication in C.P. Thunberg's Trav., published in 1796. It was used in conjugation as "Awa nori", probably referring to what is now called aonori. The Japanese nori industry was in decline after WWII, when Japan was in need of all food that could be produced. The decline was due to a lack of understanding of nori's three-stage life cycle, such that local people did not understand why traditional cultivation methods were not effective. The industry was rescued by knowledge deriving from the work of British phycologist Kathleen Mary Drew-Baker, who had been researching the organism Porphyria umbilicalis, which grew in the seas around Wales and was harvested for food, as in Japan. Her work was discovered by Japanese scientists who applied it to artificial methods of seeding and growing the nori, rescuing the industry. Kathleen Baker was hailed as the "Mother of the Sea" in Japan and a statue erected in her memory; she is still revered as the savior of the Japanese nori industry. In the 21st century, the Japanese nori industry faces a new decline due to increased competition from seaweed producers in China and Korea and domestic sales tax hikes. The word nori started to be used widely in the United States, and the product (imported in dry form from Japan) became widely available at natural food stores and Asian-American grocery stores in the 1960s due to the macrobiotic movement and in the 1970s with the increase of sushi bars and Japanese restaurants. Production and processing of nori is an advanced form of agriculture. The biology of Pyropia, although complicated, is well understood, and this knowledge is used to control the production process. Farming takes place in the sea where the Pyropia plants grow attached to nets suspended at the sea surface and where the farmers operate from boats. The plants grow rapidly, requiring about 45 days from "seeding" until the first harvest. Multiple harvests can be taken from a single seeding, typically at about ten-day intervals. Harvesting is accomplished using mechanical harvesters of a variety of configurations. Processing of raw product is mostly accomplished by highly automated machines that accurately duplicate traditional manual processing steps, but with much improved efficiency and consistency. The final product is a paper-thin, black, dried sheet of approximately 18 cm × 20 cm (7 in × 8 in) and 3 grams (0.11 oz) in weight. Several grades of nori are available in the United States. The most common, and least expensive, grades are imported from China, costing about six cents per sheet. At the high end, ranging up to 90 cents per sheet, are "delicate shin-nori" (nori from the first of the year's several harvests) cultivated in Ariake Sea, off the island of Kyushu in Japan. In Japan, over 600 square kilometres (230 sq mi) of coastal waters are given to producing 350,000 tonnes (340,000 long tons) of nori, worth over a billion dollars. China produces about a third of this amount. Nori is commonly used as a wrap for sushi and onigiri. It is also a garnish or flavoring in noodle preparations and soups. It is most typically toasted prior to consumption (yaki-nori). A common secondary product is toasted and flavored nori (ajitsuke-nori), in which a flavoring mixture (variable, but typically soy sauce, sugar, sake, mirin, and seasonings) is applied in combination with the toasting process. It is also eaten by making it into a soy sauce-flavored paste, nori no tsukudani (海苔の佃煮). Nori is sometimes also used as a form of food decoration. Raw seaweed is 85% water, 6% protein, 5% carbohydrates, and has negligible fat (table). In a 100 gram reference amount, seaweed is a rich source (20% or more of the Daily Value, DV) of vitamin A, vitamin C, riboflavin, and folate (table). Seaweed is a moderate source (less than 20% DV) of niacin, iron, and zinc. Seaweed has a high content of iodine, providing a substantial amount in just one gram. A 2014 study reported that dried purple laver ("nori") contains vitamin B12 in sufficient quantities to meet the RDA requirement (Vitamin B12 content: 77.6 μg /100 g dry weight). By contrast, a 2017 review concluded that vitamin B12 may be destroyed during metabolism or is converted into inactive B12 analogs during drying and storage. The Academy of Nutrition and Dietetics established in 2016 that nori is not an adequate source of vitamin B12 for humans. Nori contains toxic metals (arsenic and cadmium), whose levels are highly variable among nori products. It also contains amphipod allergens that can cause serious allergic reactions, especially in highly sensitized crustacean-allergic people. Therefore, daily consumption of high amounts of dried nori is discouraged. ^ a b Melina V, Craig W, Levin S (2016). "Position of the Academy of Nutrition and Dietetics: Vegetarian Diets". J Acad Nutr Diet. 116 (12): 1970–1980. doi:10.1016/j.jand.2016.09.025. PMID 27886704. ^ a b c Bito T, Teng F, Watanabe F (2017). "Bioactive Compounds of Edible Purple Laver Porphyra sp. (Nori)". J Agric Food Chem (Review). 65 (49): 10685–10692. 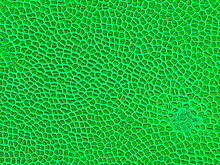 doi:10.1021/acs.jafc.7b04688. PMID 29161815. ^ Kodansha encyclopedia of Japan. 6. Kōdansha. 1983. p. 37. ISBN 978-0-87011-620-9. The word nori is used in Japan both as a general term for seaweed and as a name for a species of red algae (Pyropia tenera) that is commonly used as a foodstuff and is also known as asakusa-nori. ^ Nisizawa, Kazutosi; Noda, Hiroyuki; Kikuchi, Ryo; Watanabe, Tadaharu (September 1987). "The main seaweed foods in Japan". Hydrobiologia. 151-152 (1): 5–29. doi:10.1007/BF00046102. In the Law of Taiho (AD 701) which was established by the Emperor at that time, marine algae such as Laminaria, Undaria and its sporophyll, Pyropia and Gelidium are included among marine products which were paid to the Court as tax. ^ Hiroshi, Terayama (2003). 和漢古典植物考 (Japanese and Chinese Classical Botany). asaka Shobō. p. 588. 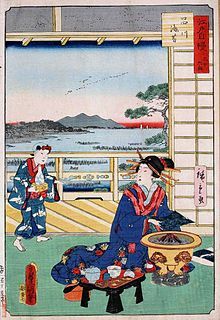 There is a description "local people were drying nori" in Hitachi Province Fudoki (721–721), and also there is a description "nori was harvested" in Izumo Province Fudoki (713–733). These show nori was used as food from ancient times. ^ Miyashita, Akira (2003). 海苔 [Nori]. Hosei University Press. ISBN 978-4588211119. ^ Katada, Minoru (1989). 浅草海苔盛衰記 [Asakusa nori rise and fall]. Seizando-Shoten Publishing. ISBN 978-4425822515. ^ Shimbo, Hiroko (2001). The Japanese kitchen: 250 recipes in a traditional spirit. Harvard Common Press. p. 128. ISBN 1558321772. Unlike wakame, kombu, and hijiki, which are sold in the form of individual leaves, nori is sold as a sheet made from small, soft, dark brown algae, which have been cultivated in bays and lagoons since the middle of the Edo Era (1600 to 1868). The technique of drying the collected algae on wooden frames was borrowed from famous Japanese paper-making industry. ^ "After 40-year no-show, famed Asakusa nori makes comeback". The Asahi Shimbun. January 6, 2005. Inspired by Japanese paper-making, fishermen processed harvested seaweed into thin, square-shaped sheets. ^ a b "Nori". Oxford English Dictionary, Third Edition. September 2012. Retrieved 25 March 2013. ^ Oi, Mariko (2015-02-23). "Japan's seaweed harvesters miss out on growth plans". BBC News Services. Retrieved 4 February 2016. ^ "Natural Foods Pioneer Michio Kushi Dies at 88". The Rafu Shimpo. 2015-01-07. Retrieved 4 February 2016. ^ Allen, Matthew and Rumi Sakamoto (2011-01-24). 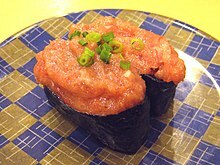 "Sushi Reverses Course: Consuming American Sushi in Tokyo　寿司逆流−−東京におけるアメリカ風寿司". The Asia-Pacific Journal: Japan Focus. 9 (5, No. 2). Retrieved 4 February 2016. ^ Goode, J. J. (January 9, 2008). "Nori Steps Away From the Sushi". The New York Times. Retrieved 25 March 2013. ^ Shurtleff, William; Aoyagi, Akiko (1975). The Book of Tofu: Food for Mankind, Volume 1. Soyinfo Center. p. 327. ISBN 978-0394734316. ^ "Iodine Fact Sheet for Health Professionals". National Institutes of Health. February 11, 2016. Retrieved May 1, 2016. ^ Watanabe, Fumio; Yabuta, Yukinori; Bito, Tomohiro; Teng, Fei (2014-05-05). "Vitamin B12-Containing Plant Food Sources for Vegetarians". Nutrients. 6 (5): 1861–1873. doi:10.3390/nu6051861. ISSN 2072-6643. PMC 4042564. PMID 24803097. Wikimedia Commons has media related to Nori (food).